The N.C. Chronicles. : Is Justin Trudeau telling women how to think? How to vote? Is Justin Trudeau telling women how to think? How to vote? If this guy had any respect for women, he would acknowledge women have the mindset and capabilities to elect and nominate whoever they choose at party conventions, they fully participates in said nominations, vote freely for who they like, and do not base their decision on gender but on who can provide the best for their families. In the link above, they post, "is trudeau the candidate women have been waiting for"
Let's rephrase that to reality; "is trudeau the candidate feminists have been waiting for"
I have doubts about him because he doesn't seem to be able to accept women can make their own decisions, and if they decide on the male candidates, they must be respected for their choices. According to him women need to be "guided" on how to vote. According to who's views? Then we have this little gem, "when old men get to decide what a woman does with her body are long gone." Ok justin, just make sure old women(aka;your cat loving feminist friends) do not have the right to tell men what to do either....works both ways boy. The ndp is even worse. No, not promoting the conservatives either, just pointing out the invasive policies of second rate politicians. I want my daughters to have their choices respected, not told by some manginas that they don't know what they are doing and need the help of a "man" to tell them they should vote for women, in order to make that "man" more popular and for him to get power under false pretences. If women vote for a man, they must be respected for the intelligence they have to make the right decision, not been told by some "man" that they are making a mistake and he knows what's best for them. Hey Justin ! My daughters are perfectly capable of deciding who will represent them by themselves, they don't need you....or your feminist masters. 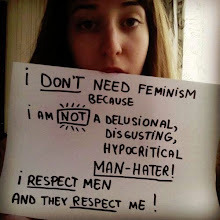 Respect their decisions..
u got a point there,dont need a man to tell me who to support or vote for.